MUNIFICENT GIFT OF BARRON BELL FUND TRUST. On Saturday, an ideal spring day, a large gathering of ringers was attracted to the dedication and opening of the recast and rehung ring of eight bells at St. Mary's Parish Church, Portsea. The church is one of the largest and most beautiful parish churches in England and has always been considered the "nursery of future bishops." The present Archbishop of Canterbury (Most Rev. Cosmo Gordon Lang, D.D.) was its former Vicar (1896-1901), and he was preceded by the Rev. Canon Edgar Jacob, who was afterwards Bishop of Newcastle and then Bishop of St. Albans. It was whilst he was Vicar of Portsea that the present magnificent structure was erected, the present Archbishop of Canterbury being a curate under him. Yet still another bishop comes from this huge parish; he is the present Bishop of Winchester (Rt. Rev. C. F. Garbett), who was Vicar of Portsea from 1909-1919. He was first appointed to the Bishopric of Southwark in 1919 and succeeded to the See of Winchester in 1932. 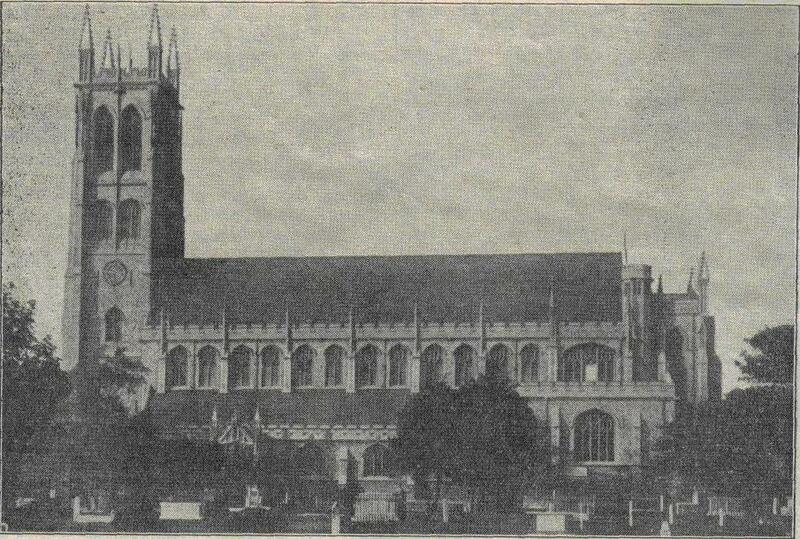 The church was always considered to be the future Cathedral of the Diocese of Portsmouth, but it fell to the lot of the ancient Parish Church of St. Thomas-a-Becket to fill this role when the diocese was formed in 1926. PARISH CHURCH OF ST. MARY, PORTSEA. The former ring of eight bells, which did duty from 1889 till 1932, were of a mixed variety. They were taken from the old church and were cast by the Whitechapel Foundry in 1764 as a peal of six. When the present building was completed, a new treble and tenor were added and the old 4th and tenor were recast to complete the octave. So that of the ring of eight the 2nd, 3rd, 4th and 6th were 1764 bells and the remainder 1889. It was during the early summer of last year that it became evident that these bells, which were hung in an oak frame some 70 ft. above the ringing chamber, would be unsafe to carry out the duties required of them. The tower was consequently closed for further ringing until such times as financial opportunities presented themselves to restore them. The parish is a very large one, comprising 40,000 souls, and also a very poor one, and it was reluctantly felt that the bells, owing to this, must perforce remain silent for, perhaps, some considerable time. As this tower was considered the home of Surprise ringing in that area of Hampshire (the first peals of Yorkshire, Lincolnshire and Pudsey Surprise Major by the Winchester and Portsmouth Diocesan Guild having been rung here), this was a severe blow to the ringers concerned. However, things did not work out as expected, and when it was brought to the attention of Mr. F. Hopkins (senior trustee of the Barron Bell Fund Trust), he promised to do his best towards getting the other trustees to help to restore the bells. The result was astounding and the offer to completely recast and rehang the bells as a gift was accepted with complete gratitude. The work was entrusted to Messrs. J. Taylor and Co., of Loughborough, arrd has been carried out with their usual complete thoroughness. The new bells have been hung in a new iron frame some 25ft. lower in the tower than the old ring, and are surrounded by a complete soundproof arrangement in the windows. All the sound of the bells has now to go up some 30ft. before reaching the louvres, and the bells thus make less noise in the immediate neighbourhood. All those present at the opening were unanimous in the opinion that the "go" and tone of the new bells (tenor 17 cwt. 0 qr. 7 lb. in F) is nothing short of excellent. Treble, 5th, 7th and tenor: 1889. Recast 1933. 2nd, 3rd, 4th and 6th: 1764. Recast 1933. F. HOPKINS, C. M. WALROND, H. W. ELDRED, TRUSTEES. The dedication was performed on Saturday by the Archdeacon of Portsmouth (the Ven. H. N. Rodgers), and was attended by ringers from Christchurch, North Stoneham, Bishopstoke, Brighton, Hughenden, Crawley, Worthing, Ryde, Ventnor, Godshill, Fareham, Hambledon, Godalming, Guildford, Haslemere, Petersfield, etc. Mr. F. Hopkins (senior trustee of the Barron Bell Fund Trust) was present with his wife, and Mr. J. P. Fidler (Loughborough) represented the bellfounders. A large congregation attended the service, and, following the hymn, "Jesus, where'er Thy people meet, " the Archdeacon addressed the gathering. He spoke of the uplifting power of church bells upon the inhabitants of city, towns and villages, their sound being used as a universal expression both of joy and sorrow, as well as many other national feelings. They also played a tremendous part in church life as a reminder, and sometimes as a reproach, to worshippers. St. Mary's was a great church situated in a great city, and its tower, dominating the homes of the city, was, he thought, symbolical in a way of the Church's position. They had assembled that day to dedicate to the glory of God a gift of great treasure and responsibility, and he hoped that the bells would, as he was sure would be the case, be rung with skill and devotion to God's praise and service. Their own Diocesan Guild of Bellringers was a part of the Church's strength, and he wished it all prosperity in its unique and highly skilful work. The lesson, taken from Ephesians, was read by the Rev. T. B. Randolph, M.A., and, following the hymn, "Christ is made the sure Foundation," the dedication ceremony took place. It was conducted by the Archdeacon, accompanied by the Vicar (Canon G. C. L. Lunt, M.A., M.C. ), the churchwardens, clergy, choir and bellringers. Immediately after the ceremony the ringers ascended to the ringing chamber and rang a short touch. The service concluded with the singing of the hymn, "Unchanging God, Who livest." After the service the visiting ringers adjourned to the Church Hall for tea, being the guests of the St. Mary's ringers. At the conclusion the Vicar welcomed the visitors and invited them to try the new bells. He asked them to regard Portsea belfry as being always available to ringers to further strengthen and foster the comradeship of the art. The ringers then visited the tower and rang touches in all the standard methods as well as Superlative, London and Bristol and Spliced Surprise in four methods. Will all ringers make a note that the tower will be open again for general ringing on Saturday, May 13th. THE NEW BELLS AT PORTSMOUTH. A meeting organised to enable all who desired to do so to ring on the new peal of bells at St. Mary's Church, Portsea, Portsmouth, was held on May 13th, and brought together a numerous company. The bells, as already described in these columns, are a product of the Loughborough Bell Foundry, and replace an octave of mixed origin. The restoration was made possible by the generosity of the Barron Bell Trust, and the work, which has been carried out is so complete and thorough that the conditions both inside and outside the tower are as perfect as human ingenuity can make them. St. Mary's Church, itself of almost cathedral-like proportions, with its tall, pinnacle-surmounted tower, was opened in 1899, and the bells then installed were an octave that consisted of four of a ring of six, cast in 1764 and taken from the previous church, and four new bells. Last year it became unsafe to ring them, and, in view of the other needs of the large but poor parish, it seemed as if the restoration might have to be long delayed. Thanks, however, to the interest taken by Mr. F. Hopkins, senior trustee of the Barron Bell Fund, the whole cost of the work was provided by the Trust, and St. Mary's Church is now in possession of one of the finest rings of eight at their weight in existence. In some respects we believe the bells are of experimental dimensions, but if that be so the experiment has been more than justified. The tenor of 17 cwt. 7 lb. is in F (instead of the customary E), the trebles are more powerful than is often found in rings of this size, and the whole peal is beautifully balanced. In the ringing room every bell is heard to perfection, and outside in the busy street the sound is so modulated that it can be no possible source of annoyance to the public. This result has been brought about by similar action to that taken at Lincoln Cathedral. Formerly the bells swung in the louvres in the upper part of the tower; the new bells have now been erected at a level 25ft. lower, the windows at this stage having been made sound proof. Another result of the lowering of the bells has been a great improvement in the convenience of handling. Previously there was 70ft. of rope between the ringers and the bells. The frame and the fittings are "the last word" in modern bell engineering. Saturday's gathering was, in a sense, an informal one. It brought together ringers from Alverstoke, Beckenham, Brighton, Fareham, Farnborough, Godalming, Gosport, North Stoneham, Portsmouth (the Cathedral and St. Mary's), Ryde, Titchfield, Wickham, Winchester, Woking, etc., while Mr. J. P. Fidler represented the bell founders. The bells were kept going merrily to a variety of methods, from rounds for the novices up to Spliced Surprise in four methods, although the latter just failed to "stay the course." Courses in at least half a dozen Surprise methods were rung, but there was no neglect of the simpler things, and under the direction of Mr. F. W. Rogers, the Guild secretary and tower conductor, the ringing wants of everyone were supplied. The Guild's service, conducted by the Vicar (Canon G. C. L. Lunt) was held, a feature of it being the glorious singing of a full choir. Canon Lunt's address, which was prefaced with a warm welcome to the ringers, was based upon the words, "And in that day there shall be upon the bells of the horses Holiness unto the Lord." The lessons which he drew from it were the need in the present day for holiness in work, holiness in worship and holiness in the home. A happy party afterwards sat down to tea together in the Church Hall, and handbell ringing was indulged in before those present eventually returned to the tower to enjoy a further spell on the delightful ring of eight.